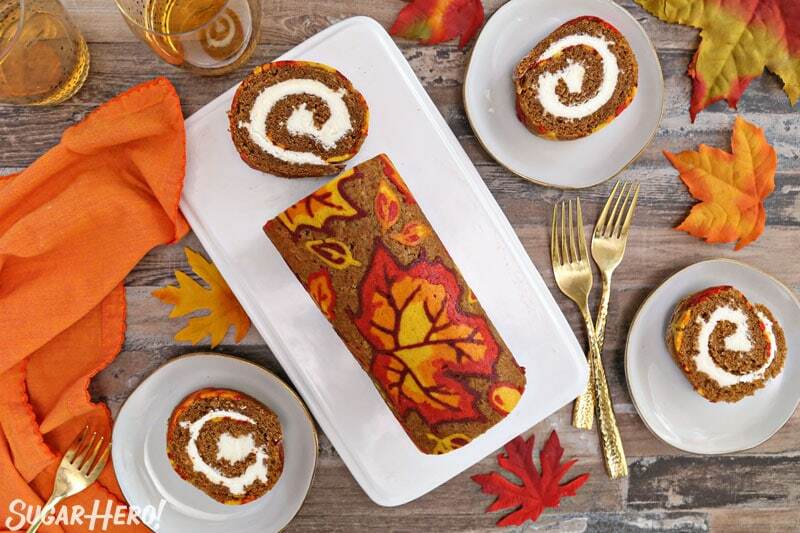 This Patterned Pumpkin Roll with a gorgeous autumn leaf decoration will be the star of your dessert table! 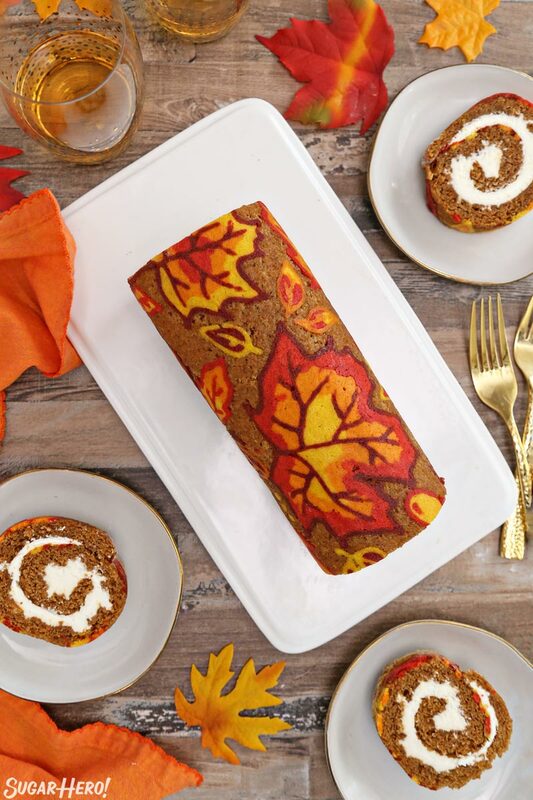 A moist pumpkin cake is rolled around a pumpkin spice cream cheese filling, and the outside is decorated with a design of colorful fall leaves. 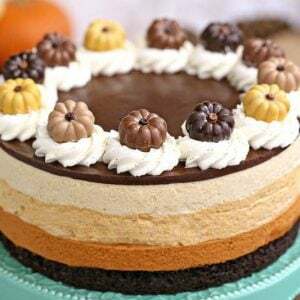 You can customize the colors and decorations however you’d like to make your perfect autumn cake. Thank you to International Delight for sponsoring this post. 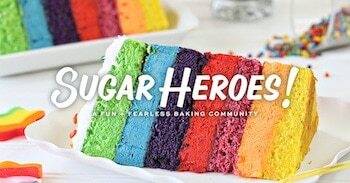 This year I’m pleased to partner with them to bring you fun and creative dessert recipes. 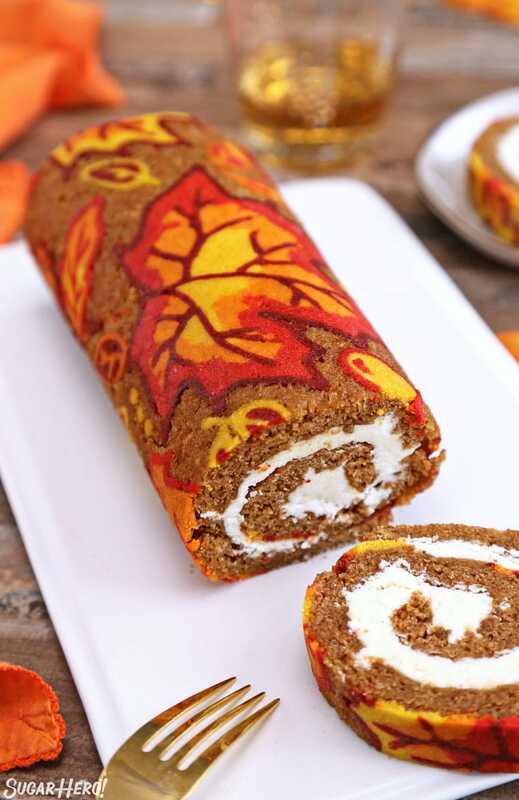 One of the beautiful things about pumpkin rolls is their simplicity–take a pumpkin sheet cake, add a bit of cream cheese frosting, a quick roll of the whole shebang, and you’ve got yourself a stellar dessert! It’s a classic for a reason, and it’s hard to improve upon this fall dessert. However, let’s never forget the SugarHero motto: “Why not do more stuff to things?” (I admit the motto could use some polishing up.) 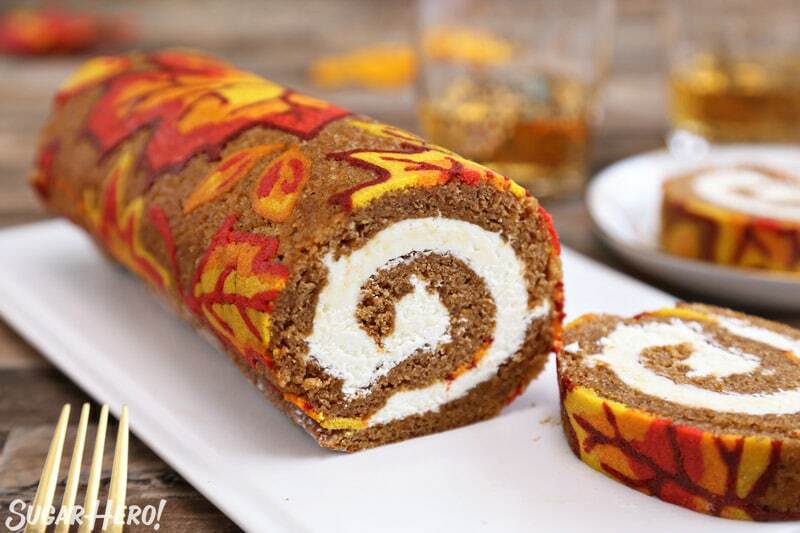 In the spirit of doing more stuff, learning new skills, and just plain old having FUN in the kitchen, we’re going to fancy up the old-fashioned pumpkin roll! 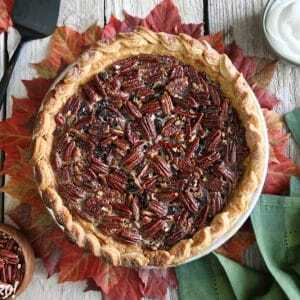 I’ll teach you how to decorate it with some beautiful, completely edible autumn leaves, to elevate it and make it worthy of even the fanciest Thanksgiving table. 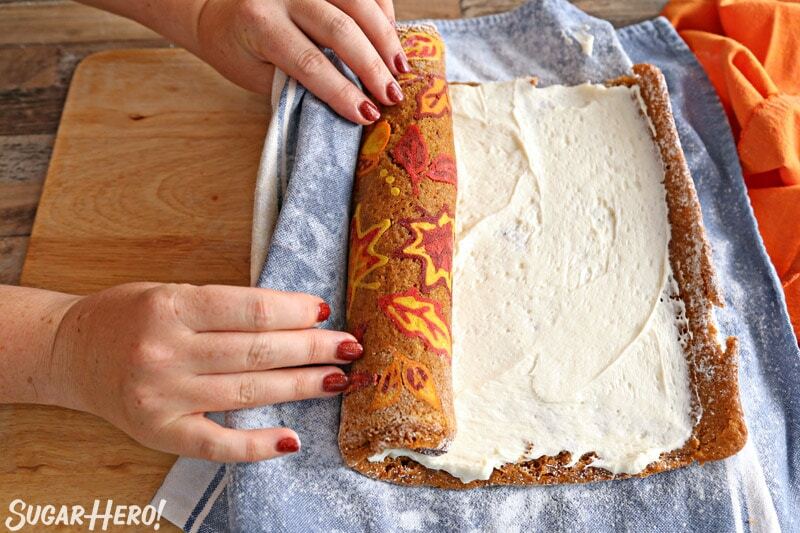 First, a disclaimer: you can make a very delicious pumpkin roll without the pattern. 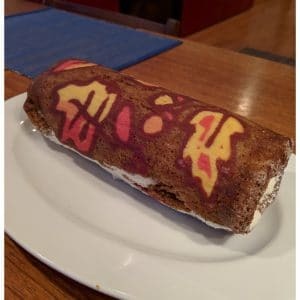 The design definitely adds extra time, so if you’re looking for something faster and easier, scroll on down to the pumpkin roll instructions and forget the design part. The moist pumpkin cake and good-enough-to-eat-with-a-spoon pumpkin spice filling is excellent on its own. For the rest of us, though, this is where the fun begins! Step 1 is choosing your design. I based my autumn leaves off of this free coloring page I found online. You can also draw your own design on the back of a piece of parchment. 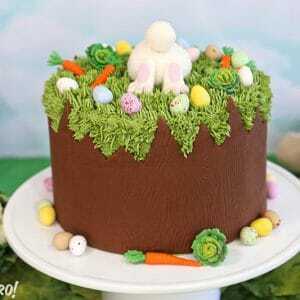 We’ll be making this cake in a 15×10-inch jelly roll pan, so size your pattern accordingly. Something without too many fine lines or too much detail is best, at least for the first attempt. Making sure that your pumpkin roll releases cleanly from the pan is a huge concern, so pan prep is very important! 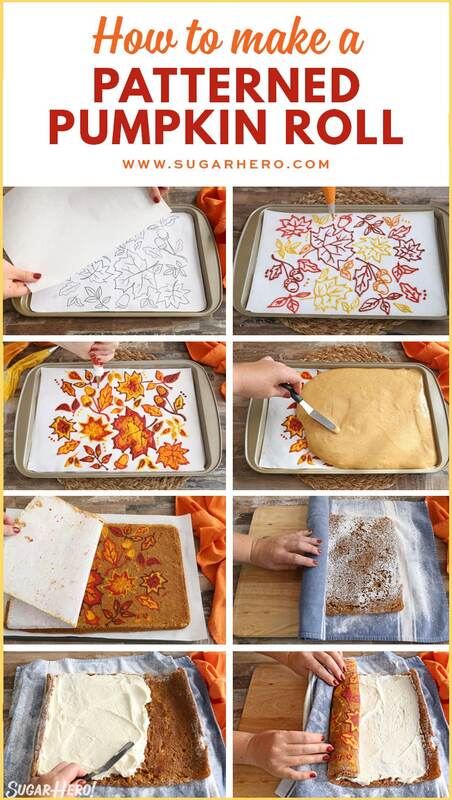 Put the pattern template in your jelly roll pan, then a sheet of parchment on top, then spray the parchment and sides of the pan very well with nonstick cooking spray. I had the best results using baking spray (the kind with flour mixed in) and then wiping off the excess with a paper towel. 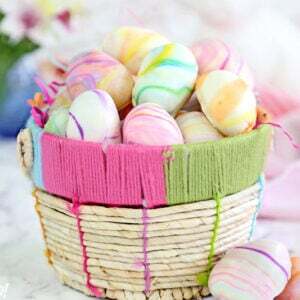 The pattern is made with a simple batter made from butter, egg whites, sugar, and flour. It should have a medium consistency: thin enough to easily pipe, but thick enough to hold its shape and not run all over. I kept the colors fairly simple–just yellow, orange, red, and burgundy. I added a bit of Ivory to each color to deepen them and give them more of a fall tone. I tried a few variations of this pattern on a pumpkin roll cake, including just outlining the shapes, a mix of outlined shapes and filled shapes, and completely filled shapes. The one that looked the best by far was when I outlined each shape and then filled it in completely with a contrasting color. You can experiment for yourself, but for my design, coloring in the leaves was the way to go! 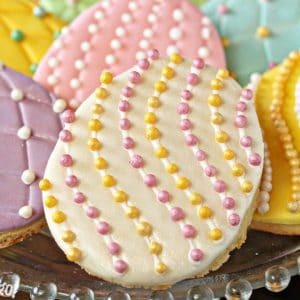 If you want to color in your pattern, I recommend piping the outline, freezing the pan for 20 minutes to let the first layer set, then adding the contrasting color on top. 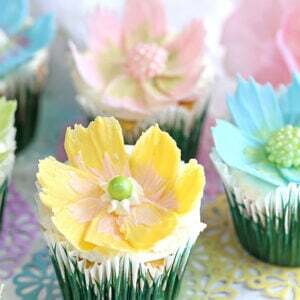 Don’t be afraid to mix colors, like the ombre effect you see in the maple leaves. Those combined colors were my favorite elements of the design. 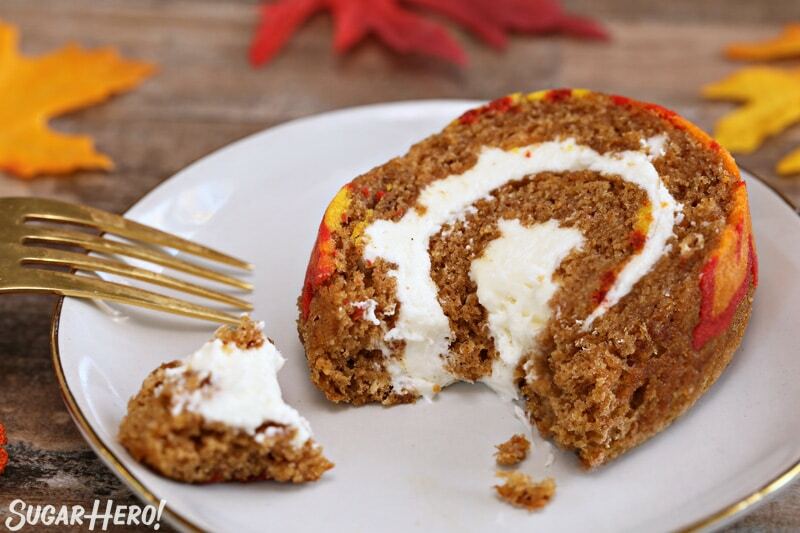 Whether you’ve created a pattern or not, the steps to rolling and filling the pumpkin roll are the same from here on out. When the pumpkin cake comes out of the oven, it is SO important to work quickly. 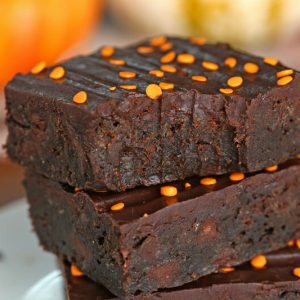 If you wait until the pumpkin cools, you’re almost guaranteed to get cracks in your cake. 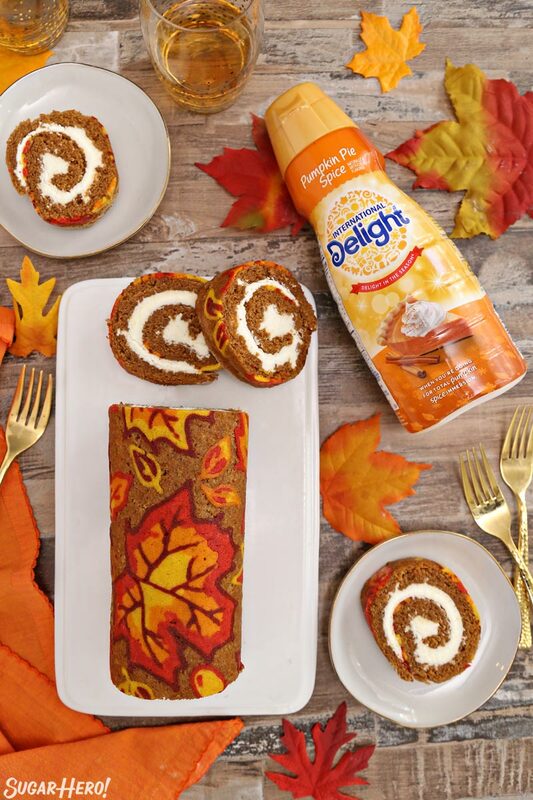 The key to a successful pumpkin roll is to roll up the cake while it’s hot, to encourage the cake to cool in that spiral shape. 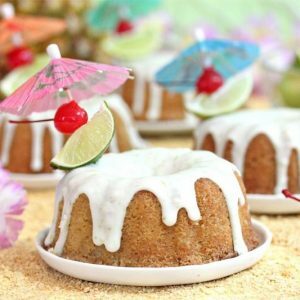 After flipping the cake out of the pan, peeling the parchment off of the bottom, and whistling in admiration at your mad piping skills, flip it back around so that the bottom of the cake is resting on top of a cotton tea towel covered with powdered sugar. Now here’s the really crazy part: the cake is rolled up along with the towel! 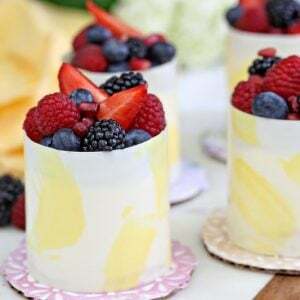 The towel is a barrier between the cake layers to prevent it from sticking to itself. 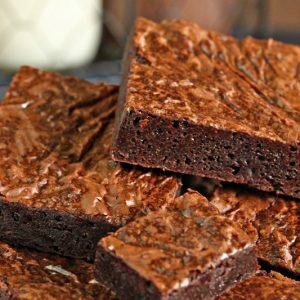 So really, don’t be shy with the powdered sugar on the towel–the more we can do to prevent the cake from sticking, the better. The cake needs to cool well, then it can be filled with cream cheese frosting (more on this in a bit!) Once it’s frosted, it’s rolled a second time. This time, we use the tea towel to guide the cake and encourage it to roll over on itself. The humble tea towel is really proving its kitchen worth in this recipe. And finally–FINALLY!–the whole thing needs to chill once more, to firm up so you can cut beautiful clean slices and wow your guests. 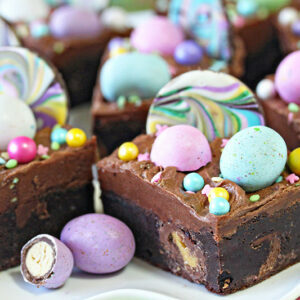 A cake roll without a chilling period is really more of a cake squish–and nobody wants a cake squish. 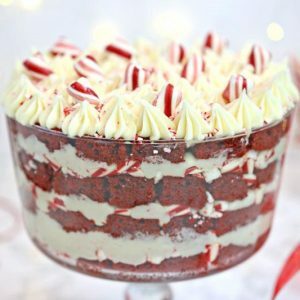 Can we talk about the actual cake and frosting recipe for a moment? The pumpkin cake is fairly standard, although it doesn’t contain butter or oil since we want it to be light and springy for the roll. 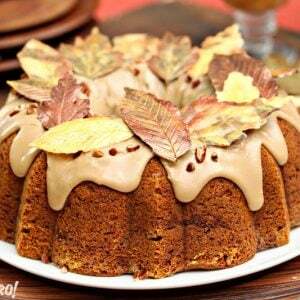 I always like to go heavy on the pumpkin pie spices, because I’m a spicy lady and I love a really flavorful fall cake. The filling starts with a simple buttercream made with International Delight Pumpkin Pie Spice creamer. 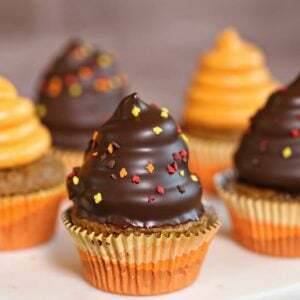 I’ve been hitting the creamer HARD this year (see these hi-hat cupcakes or pumpkin spice mousse!) 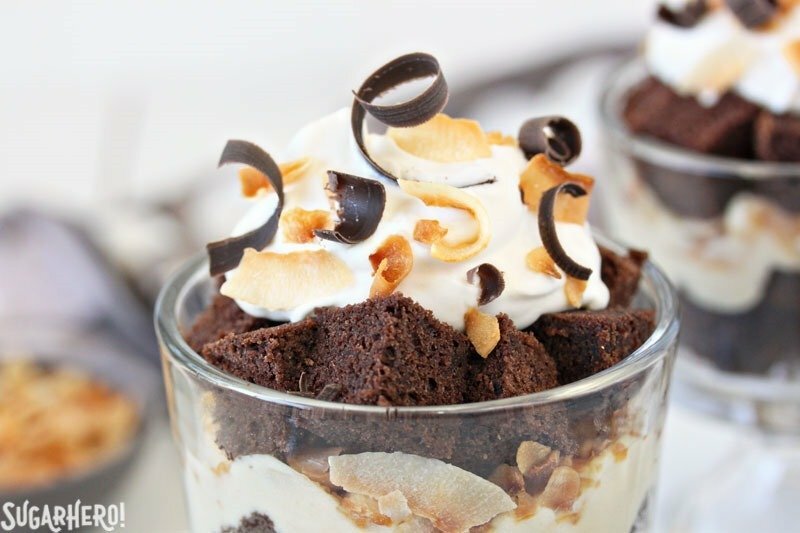 because there is nothing it can’t do, and no dessert it can’t improve. 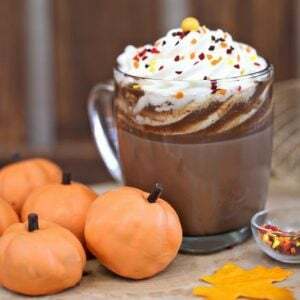 It’s such an easy way to add autumn flavor to anything, I’m more than a little obsessed! After the frosting is made, we beat a bit of cream cheese until it’s free from lumps, then add the frosting to the cream cheese. 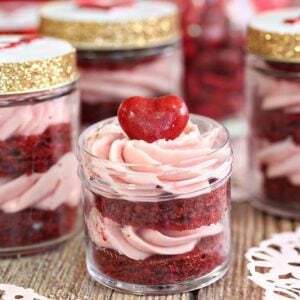 I like doing it in this order (rather than adding cream cheese to the frosting) because it keeps its texture better, and is less likely to separate. 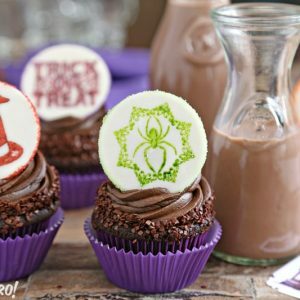 The end result is a smooth, pumpkin spice-flavored frosting with a light cream cheese taste. 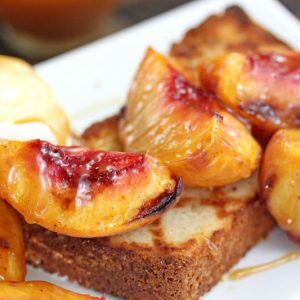 Not too gloopy, not too tangy, not too cheesy–in short, it’s perfect! 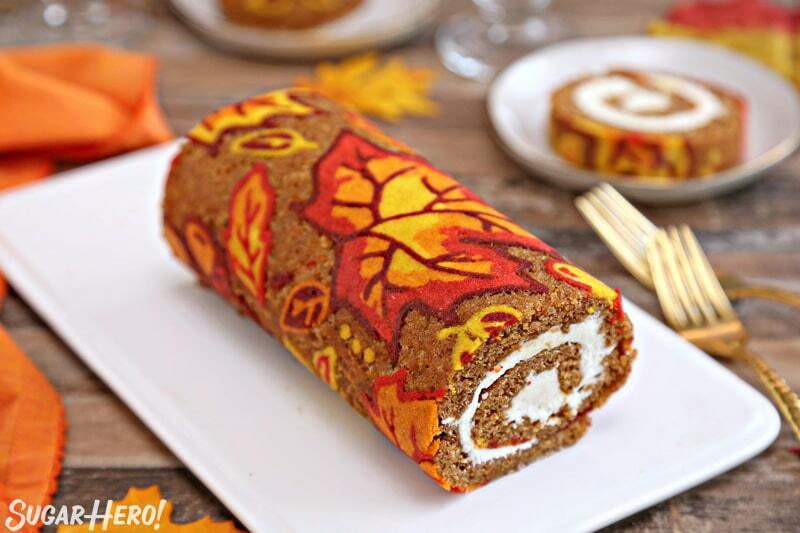 Why Did My Pumpkin Roll Crack? Can I Fix It? One of the most frustrating things about making a cake roll is the possibility that the cake might crack. This can be due to SO many different factors. 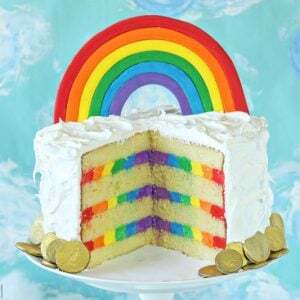 Underbaking, overbaking, handling the cake too roughly, not working quickly enough so that the cake has started to cool, Mercury in retrograde, bad kitchen karma…the list goes on. Honestly, sometimes you can do everything right and you’ll still get a few cracks. 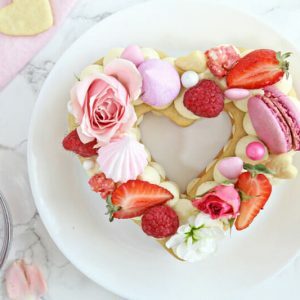 It’s just a fact of baking life. At the minimum, I encourage you to watch your cake closely while it bakes to make sure that it’s baked in the center but not overdone. And while it’s baking, read the instructions very carefully and have everything prepped and ready to go as soon as the cake is out of the oven. This will go a long way towards preventing cracks. Can cracks be fixed? 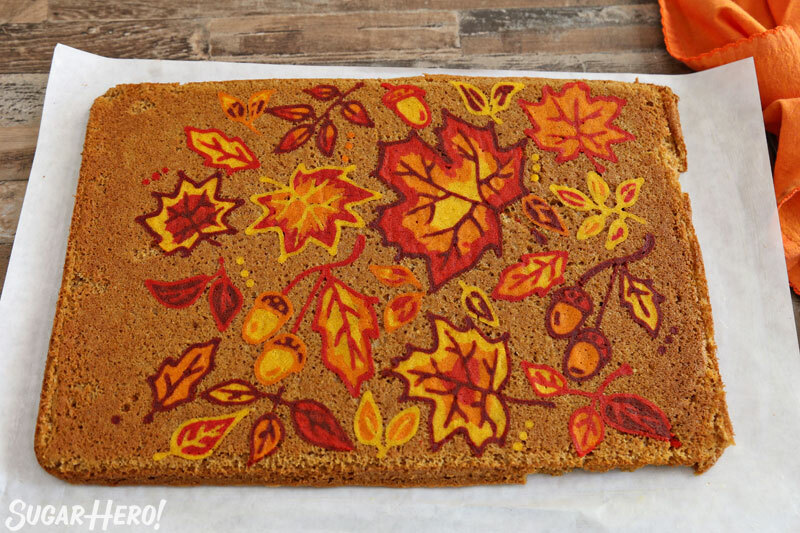 With normal pumpkin cakes, my answer is almost always “just cover it with some whipped cream!” Unfortunately, that’s not as easy to do when you’ve created an intricate autumn leaf pattern on your cake! 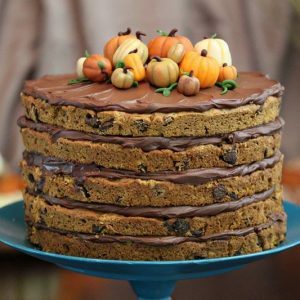 So no, it’s not entirely possible to cover a patterned pumpkin cake that has cracked. 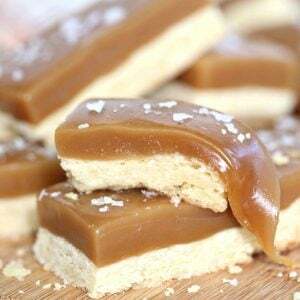 If the cracks are towards the end, maybe slice off a few pieces and serve them on the side as if you meant to do it. 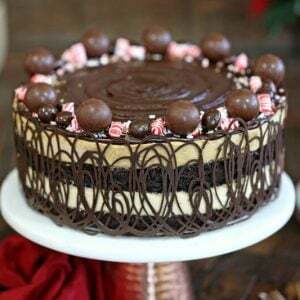 If they’re in the center of the cake, serve your cake with a smile, remember that you’re amazing, and do as Julia Child said and never apologize for your cooking! 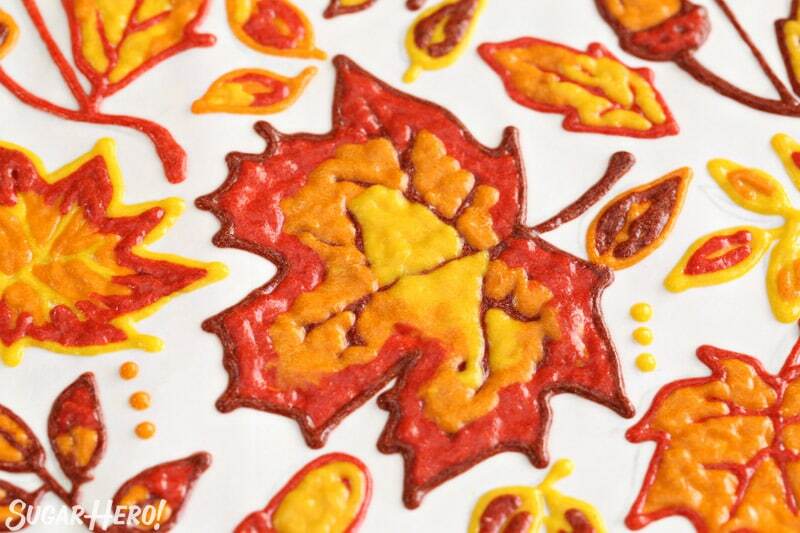 This Patterned Pumpkin Roll with a gorgeous autumn leaf decoration will be the star of your dessert table! 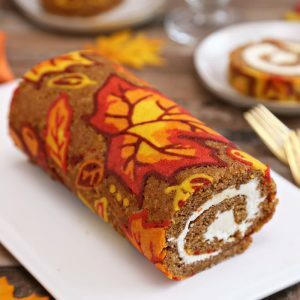 A moist pumpkin cake is rolled around a pumpkin spice cream cheese filling, and the outside is decorated with a design of colorful fall leaves. Combine all ingredients in a medium bowl. 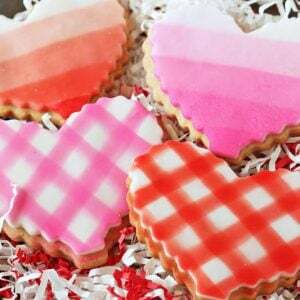 Blend with a hand mixer or stand mixer until the batter is smooth. Do not keep mixing after it’s blended, or it might start to separate. Divide the batter into 4 portions. 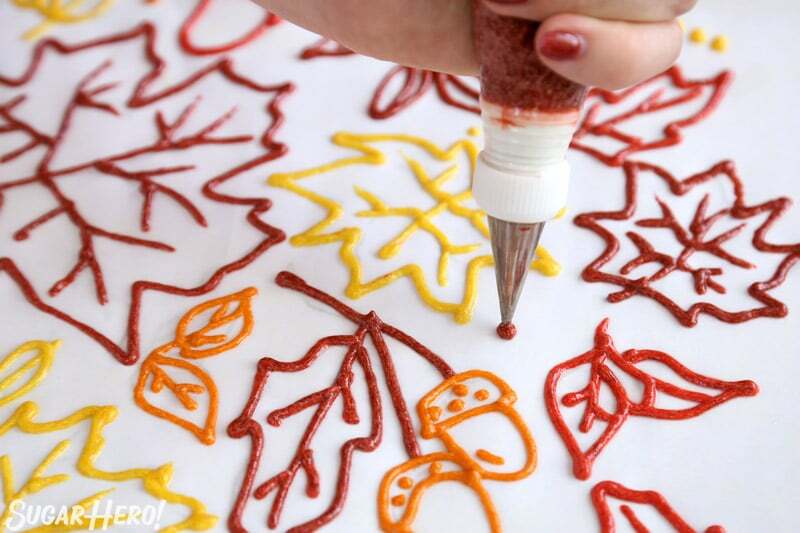 Add gel food coloring and stir until you have 4 vibrant autumn colors. I used Americolor gels in the following combinations: Ivory + Egg Yellow to make yellow, Ivory + Pumpkin to make orange, Ivory + Super Red to make red, and Chocolate Brown + Super Red to make burgundy. 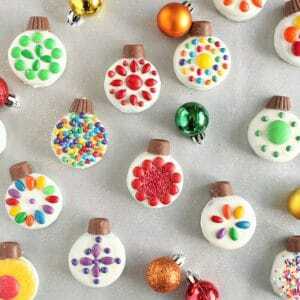 Place the colors in piping bags fitted with a small round tip – I used a #2 piping tip. Place your design template on a 10x15-inch jelly roll pan, and place a piece of parchment over it. (Alternately, draw a design on the back side of a piece of parchment paper.) Spray baking spray or nonstick spray on the piece of parchment, and wipe it lightly with paper towel to remove excess. Trace the pattern with your batter. If you want to draw outlines with one color and fill in with another, draw the outlines first and freeze for 15-20 minutes, then add the filler color on top. 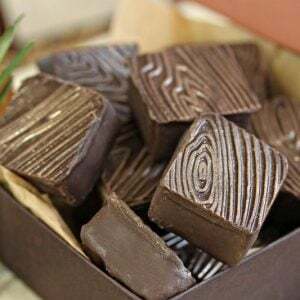 Once your pattern is complete, freeze the pan for at least 20 minutes to set the batter. (Longer is okay). While the pan is in the freezer, make the pumpkin cake batter. Preheat the oven to 350 F. Sift together the flour, baking powder, baking soda, spice, and salt in a medium bowl, and set aside. 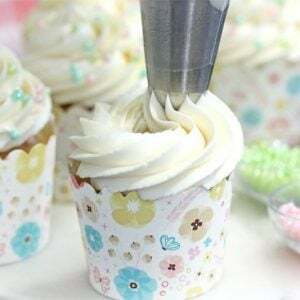 Place both sugars and the eggs in the bowl of a stand mixer fitted with a paddle attachment, and beat them together for 3 minutes until thick and light yellow. Add the pumpkin and vanilla extract, and mix until combined. Add the flour to the mixer, and mix on low speed just until combined. 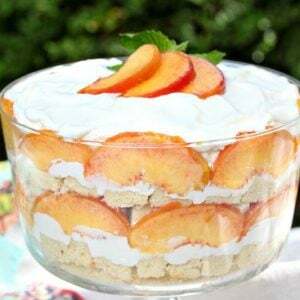 Scrape down the bottom and sides of the bowl with a spatula to finish mixing the batter. 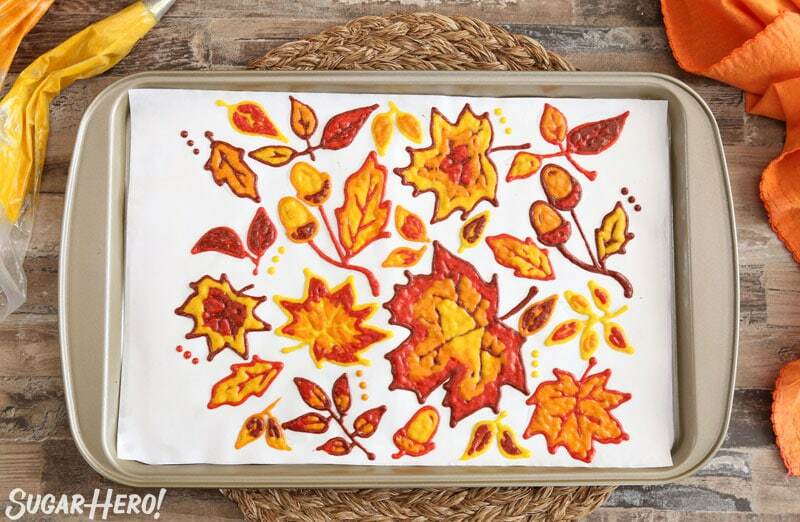 Scrape the pumpkin cake batter directly on top of the pattern you piped in the baking sheet. Smooth it into a thin, even layer. Bake for 16-18 minutes, until the cake starts to darken along the edges and it springs back when lightly pressed in the middle. As soon as the cake is done, it’s very important that you work quickly, while it is still hot, to get it out of the pan and roll it up. If you wait too long, it will mostly like crack. Once the cake is out of the oven, immediately run a knife around the edges to loosen it from the pan. 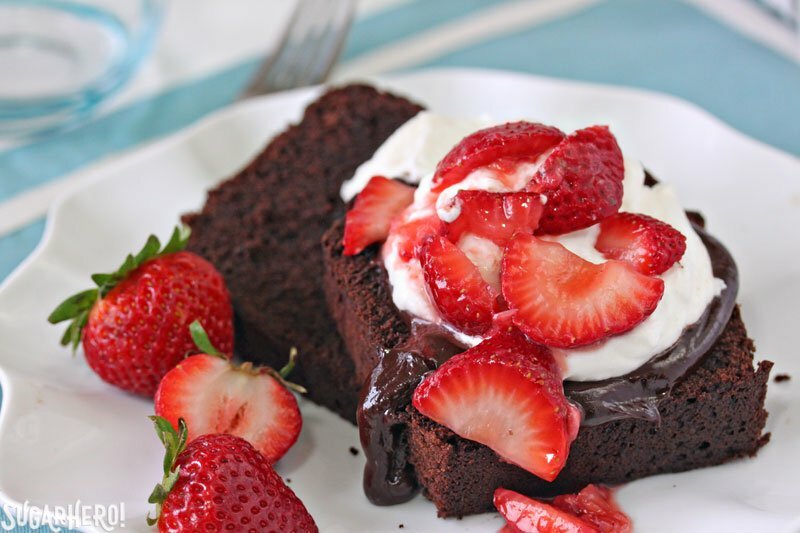 Spray a piece of parchment or waxed paper with nonstick cooking spray, and place it on top of the cake. 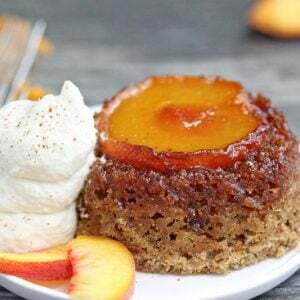 Put a baking sheet or cutting board on top of the parchment, and carefully flip the cake upside-down, so the top of the cake is resting on the cutting board. 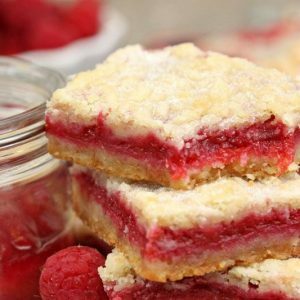 Remove the jelly roll pan and set it aside. Peel the parchment off of the bottom of the cake, revealing the design. 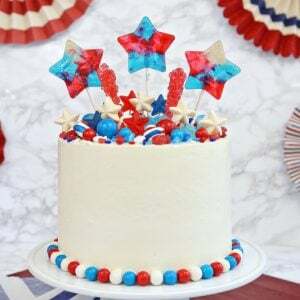 Sprinkle the top of the cake liberally with powdered sugar. 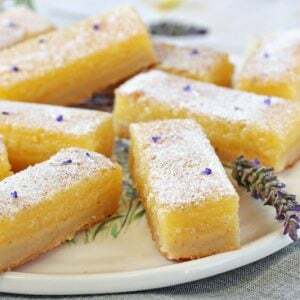 Take a cotton tea towel and sprinkle both sides with a generous amount of powdered sugar too, rubbing it into the towel. Place the sugared towel on top of the design. 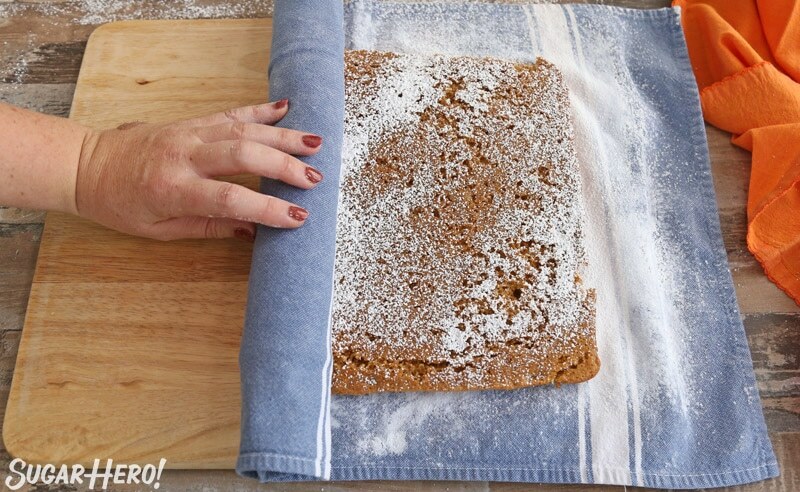 Put a cutting board or baking sheet on top of the towel, and once again flip the cake over—now the tea towel should be on the bottom, and the cake should be right side up. Remove the parchment from the top of the cake. Starting on the skinny edge, carefully roll the cake and the tea towel up together. 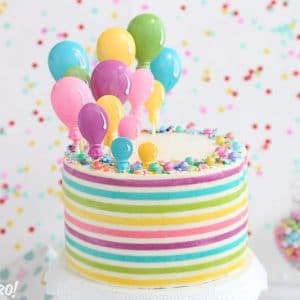 Refrigerate the cake for at least an hour. It should be completely cool before you try to unroll it. If you try too soon, it will likely crack. While you’re waiting for the cake to cool, make the pumpkin spice filling. 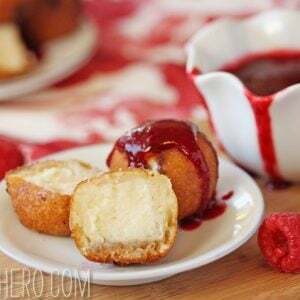 Combine the butter, powdered sugar, and salt in the bowl of a large stand mixer fitted with the paddle attachment. 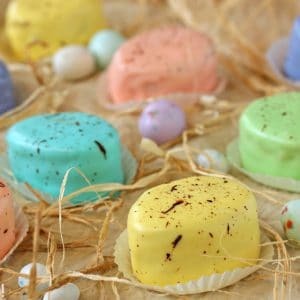 Mix them together on low speed, then gradually raise the speed to medium and beat it for 4 minutes, until the mixture is white and fluffy. Add the creamer to the bowl. Beat on low speed until it is incorporated. It is normal for the mixture to look separated (and, frankly, weird and chunky) at this stage. 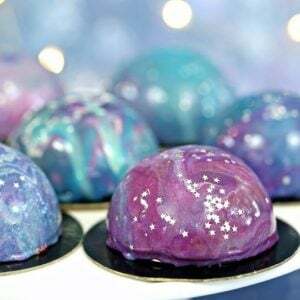 Once the liquid is mixed in, gradually raise the speed to medium and beat for another 4 minutes, until the frosting has come together, is smooth and glossy, and has a stiffer texture. 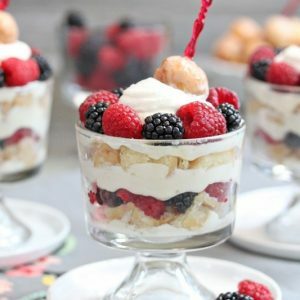 Remove the buttercream from the bowl and add the softened cream cheese. Beat it with a paddle attachment until you’re sure it’s smooth and free of lumps. 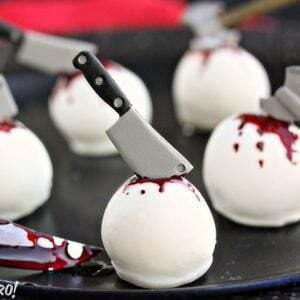 Turn the mixer to low and add the frosting to the cream cheese in 3-4 batches. 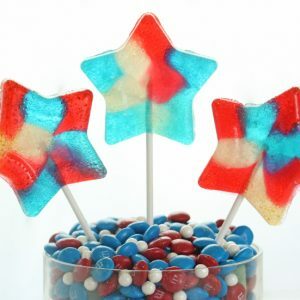 Once all of the frosting is added, stop mixing and finish stirring by hand. 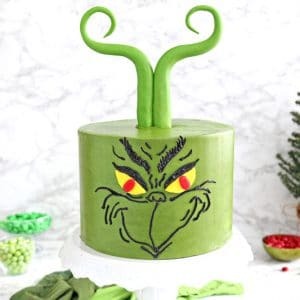 Chill until you’re ready to assemble the cake. When the cake is completely cool, carefully unroll it. Be gentle, since it will want to stick to the towel. Some cracking on the top of the cake (the undecorated side) is normal. 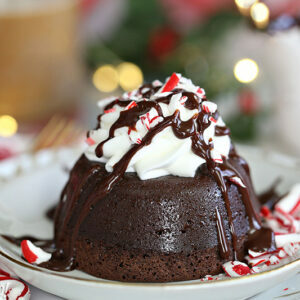 Spread the frosting in an even layer on the cake. Roll the cake up again, this time rolling it over itself and not the towel. 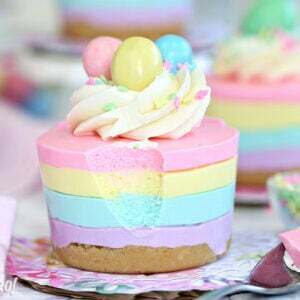 Brush the top of the cake with a light layer of simple syrup or creamer to remove the extra powdered sugar and reveal the design. 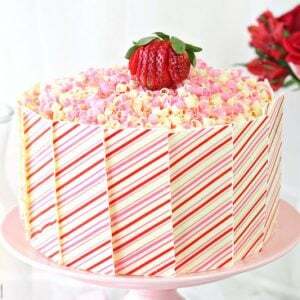 Wrap the cake in plastic wrap and refrigerate for at least 4 hours to firm it up and make it easier to cut. 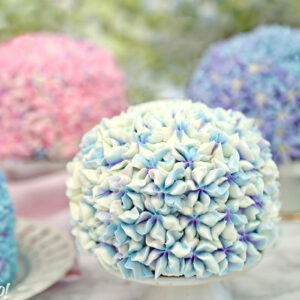 Cut the cake in 1-inch pieces and enjoy! 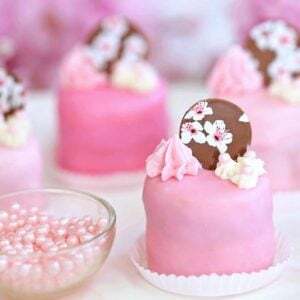 The cake can be stored, well-wrapped, in the refrigerator for up to a week. Thank you so much Becca!! 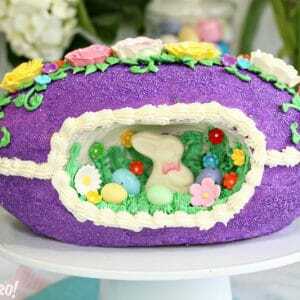 Hi Elizabeth, I love this design on the pumpkin roll so very pretty. I have a question, I know this may sound dumb but I have never sized a printed pattern before so how would I get the design as big a 10X15 sheet of paper? 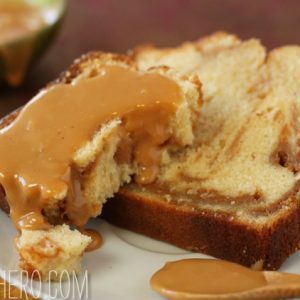 This would be great for Thanksgiving or any fall dessert. 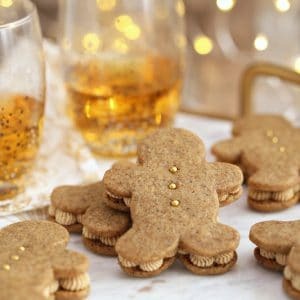 I suppose you could probably use this template for cookies also? Thank you, Debbie! It’s not a dumb question at all! I actually taped two pieces of regular (8.5×11) paper together, then trimmed it to fit the pan. The other thing you could do is print out the coloring page I linked to (or another design of your choice!) and place it under the parchment, and trace the designs onto the parchment with a dark pen or marker. 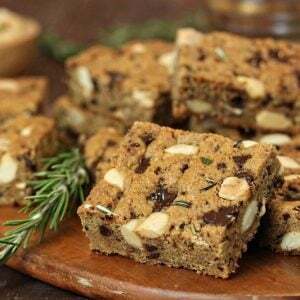 As long as you then flip the parchment so the ink doesn’t come into contact with the food, you’ll be good! The dark ink should show through the parchment enough for you to trace it with the pattern batter. I hope this helps! Let me know if you have any questions. 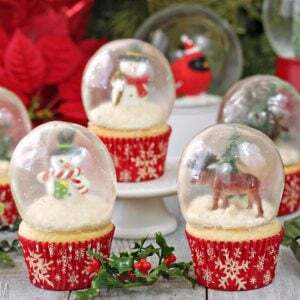 I love this idea – any suggestions on how we could use it for Christmas? Also – I have a cornucopia shaped cake pan and a sand castle shaped cake pan – any ideas on how to use/decorate these? I’ve only done pound cakes in them and they are sort of plain. Thanks for all your amazing ideas! Thank you Pat! 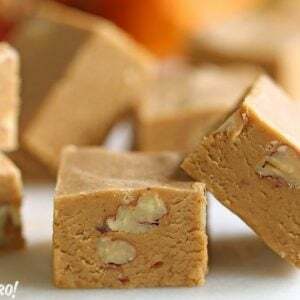 The basic pattern batter and process is the same, but unless you want pumpkin cake for Christmas, unfortunately you’ll need to use a different cake recipe. 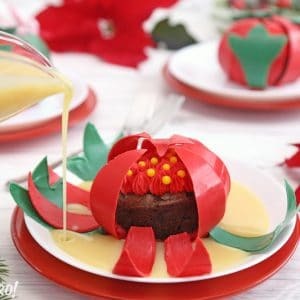 BUT I’m actually planning a Christmas variation using a white chiffon cake and a holly berry pattern! 😀 So look for that next month. Gorgeous!!! Can it be done a day ahead? Or it will be to dry? You can definitely make it a day ahead–in fact, I recommend it! Because it should chill for at least 4 hours once assembled (to get really clean cuts) it’s easiest to make this a day or two before you’ll serve it. 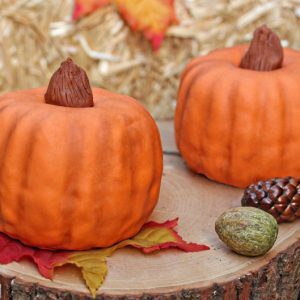 The pumpkin keeps the cake moist, and as long as you wrap it well in plastic wrap it should be fine! I do like to let it sit out for 20 minutes before serving just so it doesn’t have that straight-from-the-fridge taste and texture though! Thank you! I can’t find a 10×15 pan. Can we use a different size? Yes, I would recommend going a bit larger rather than smaller, and just watch the baking time! Please let me know how it goes if you give it a try! 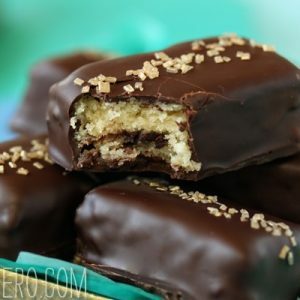 I’ve found when making any kind of a cake roll that trimming off the crispy edges prior to rolling the hot cake in a tea towel helps to prevent cracking. I use a pizza cutter to trim as close to the edge as possible. Oh my goodness! This is so cute! Excellent work! 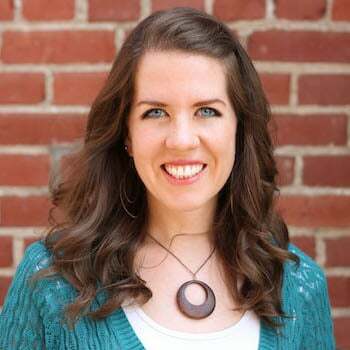 Hey Heather, Thank you so much! I really appreciate that! 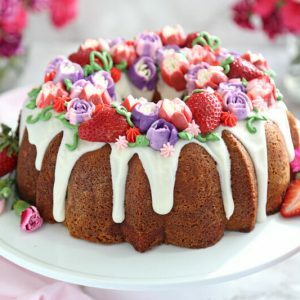 I bet this could work great with regular round cakes as well! 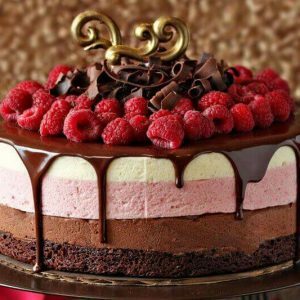 One of those with several layers of plain cake, and the frosting peeking out between layers… then a pretty design in the top layer! Hey Susan, that’s a great idea! Thanks for following along! Hi! This is so beautiful! 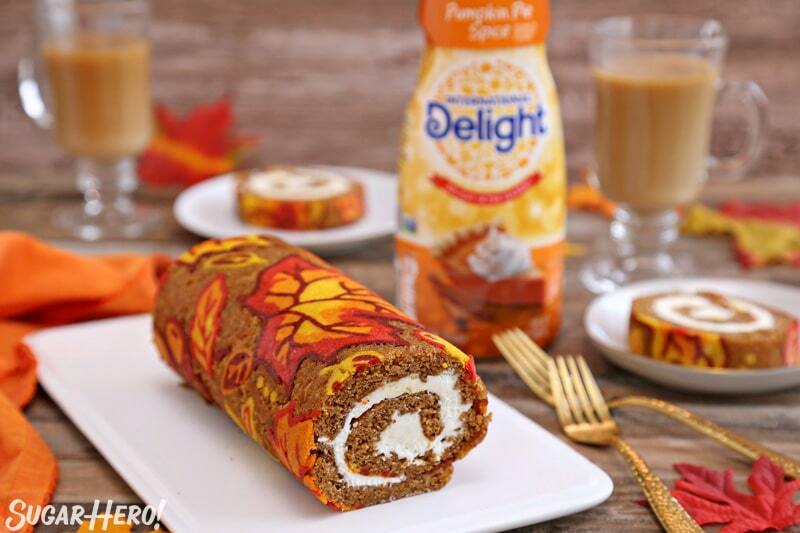 Just what I was looking for- a different and decorated spin on the pumpkin roll. 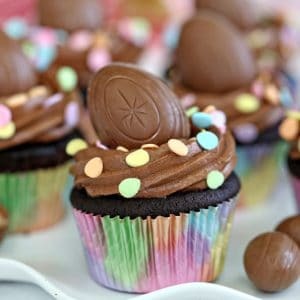 I’m going to try to make it today, fingers crossed! 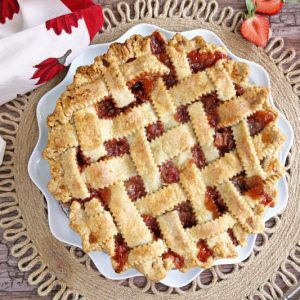 A quick question- can I make the pattern today and freeze overnight? Will this mess things up? 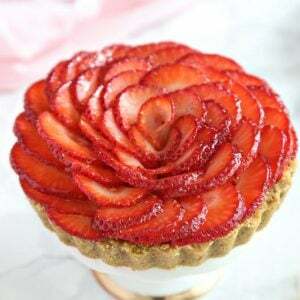 Can I simply pour the batter tomorrow and re-spray the pattern in non-stick spray after taking it out of the freezer tomorrow? Sorry for all the questions! I appreciate your time and SO admire your work.You inspire me! Thank you, Serena! You can DEFINITELY make it a day in advance! Freezing it overnight is no problem, and I wouldn’t even worry about re-spraying the next day. Please let me know how it turns out, and don’t hesitate to reach out with any questions! 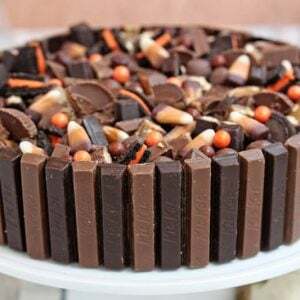 This cake was such a hit at Thanksgiving! 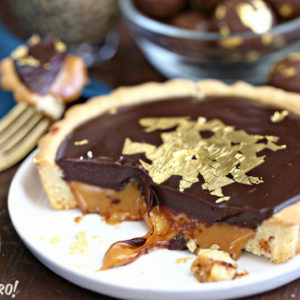 I am no professional, but with a little time I think anyone could make this. Mine cracked a bit, but it ended up still looking (and tasting) good. I didn’t do the pattern over the whole 10×15 surface because I figured only part of the pattern would be on top. Hey Shira, That is amazing! Thank you so much for sharing! I love it, I am so happy it worked out. Thanks for following along!